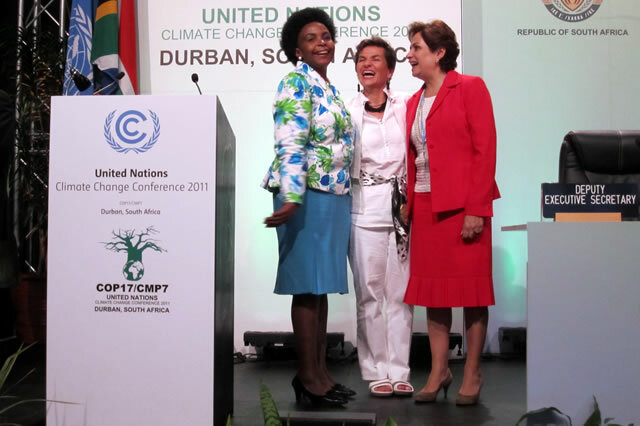 The Troika+ of women leaders includes Maite Nkoana-Mashabane, President of COP17/CMP7, Christiana Figueres, Executive Secretary of the UN Framework Convention on Climate Change, and Patricia Espinosa, Minister for Foreign Affairs, Mexico. The Foundation today, 7 December, hosted a High-Level event with Minister Maite Nkoana-Mashabane, President of COP17/CMP7 called Forward Looking Strategies – Women and Climate Change: Durban and Beyond at COP17. The Foundation today, 7 December 2011, hosted a High-Level event with Minister Maite Nkoana-Mashabane, President of COP17/CMP7 called Forward Looking Strategies – Women and Climate Change: Durban and Beyond at COP17. The meeting convened over 70 women Ministers and deputy Ministers, negotiators, key civil society figures and senior women leaders. The participants included Christiana Figueres, Executive Secretary of the UNFCCC, Connie Hedegaard, EU Commissioner for Climate Action, Melanne Verveer, US Ambassador-at-Large for Global Women’s Issues, Lena Ek, Minister for the Environment, Sweden and Assuncao Cristas, Minister for Environment and Science, Portugal. They discussed a human-centred approach to climate change that incorporates gender and sustainable development. Women from four continents spoke about the roles, responsibilities, challenges and opportunities facing women. The meeting looked at how to make real progress on the issue of gender and women’s empowerment. Climate smart agriculture and food security were also strong themes and mentioned by a number of participants. President of COP17/CMP7, Minister Nkoana-Mashabane said the problem of climate change cannot be solved without empowering women. She said women understand what climate change is because they are on the frontline picking up the pieces. Speaking about women’s leadership she said it is time for women to take the process forward. Mary Robinson introduced the Troika+ of women leaders on gender and climate change and called for those participating in the meeting to join. She invited participants to share information on what they are doing in their own countries’ to address the gender dimension of climate change and to discuss what they are doing to highlight women’s leadership at COP17 and in the lead up to RIO+20 next year. EU Commissioner Connie Hedegaard called for a focus on access to energy as we move forward from Durban. US Ambassador-at-Large for Global Women’s Issues, Melanne Verveer highlighted agriculture and cook stoves as key areas of focus for improving the lives of women. Bineta Diop of Femmes Africa Solidarité said women farmers are waiting for the outcome at Durban and “if we fail, we fail women of the world”. Closing the meeting, Minister Nkoana-Mashabane said “nothing beats the solidarity of women working together”.